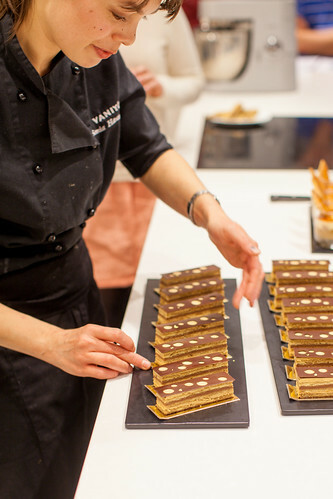 Vaniyé Patisserie opened in 2012 and I loved it at first sight, I was also very inspired by the philosophy and approach of its owners, Sonia and Laurent Haumonté – which is what led me to write a little inspiration piece called The Wisdom of Sweet Things. 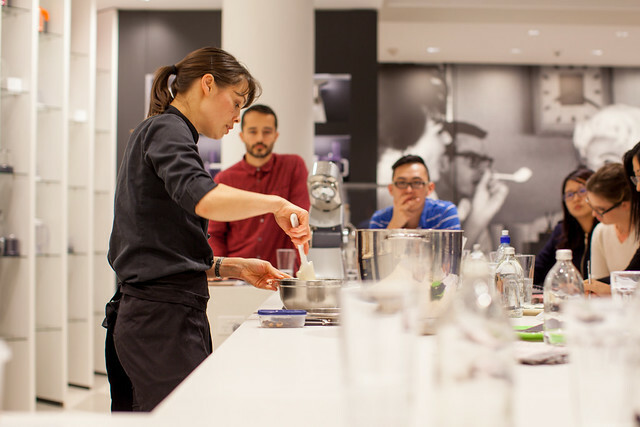 Last week I was lucky enough to attend a masterclass with Sonia. 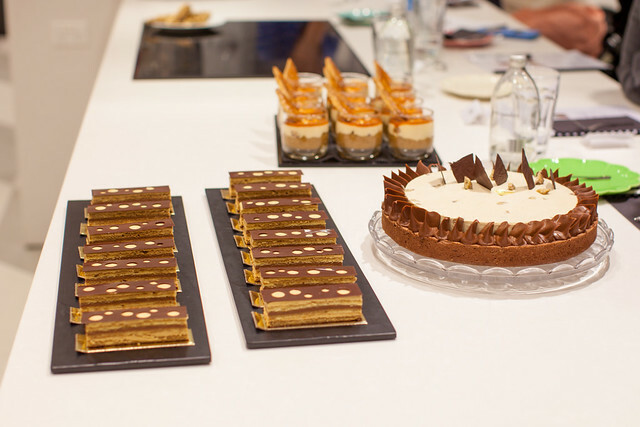 Held at the Delonghi Showroom in Newmarket, it was two and a half hours long and I left with three perfect desserts to take home and (hopefully) the ability to recreate them. 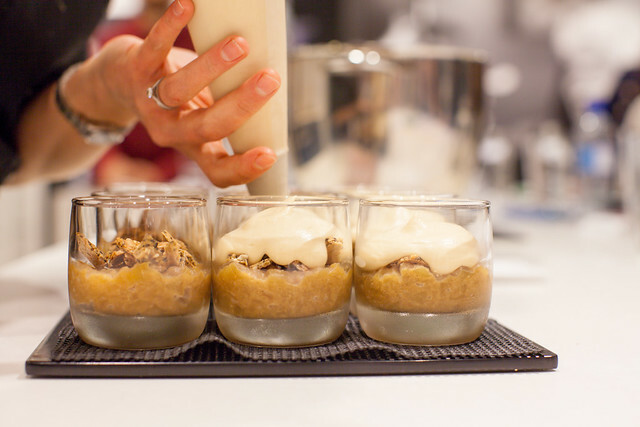 If you’ve been to Vaniyé then you know it is a study in perfection – each dessert is a masterpiece. The very thought of trying to recreate one of her recipes seemed preprosterous to me before the class. Now I feel slightly more confident. Sonia broke her recipes down into simple components and made them look easy. I filled my notebook with useful tips and tricks, so now I know the perfect consistency for whipped cream (and when to stop whipping), how to make dry caramel, and how to avoid burning my egg yokes with sugar, among other similarly delightful things. 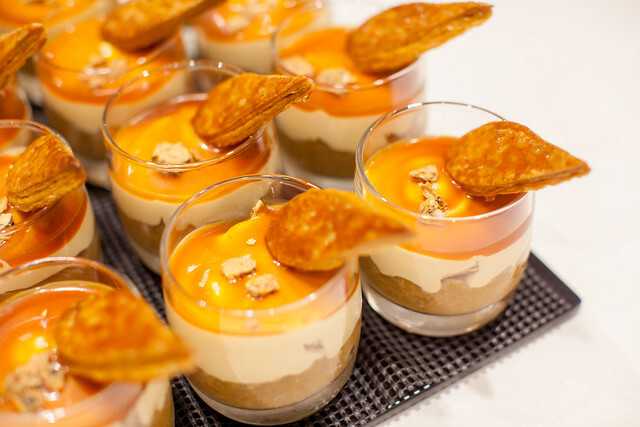 Sonia and Laurent created three desserts before our eyes – a verrine tatin (a deconstructed version of the classic tarte tatin), a mont blanc tart, and perhaps most the famous of all French gateaux, the opera. 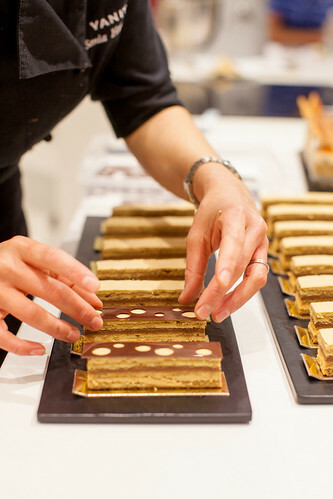 The latter was the most complex of the three – very thin layers of sponge soaked in coffee, filled with coffee buttercream, topped with either a chocolate glaze or a very delicate wafer of tempered chocolate. Laurent was also present at the class, and he retold a sweet story about trying to impress Sonia when they first began dating by making her an Opera in his tiny Parisian apartment. All went perfectly until he had the bright idea of pouring melted chocolate directly onto the perfectly assembled cake. It was a disaster (but still delicious). 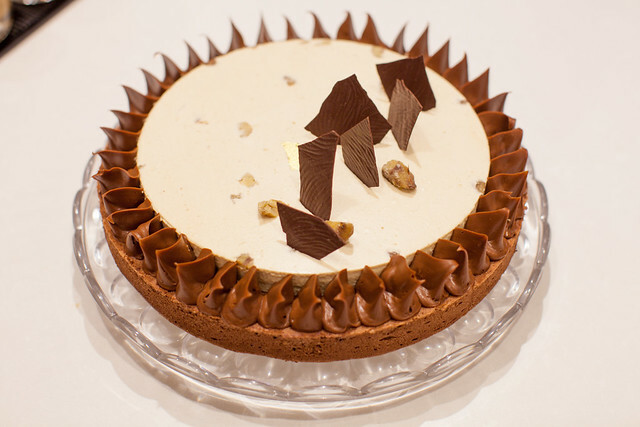 The Mont Blanc tart was incredible – a very light chocolate sponge topped with chestnut chantilly and finished with a very rich and glossy chocolate marquise. It reminded me how much I love chestnuts, and why I should visit Vaniye during chestnut season as often as I can, because Sonia makes her own puree from chestnuts imported from France. I’ve left the verrine tatin till last because Sonia has agreed to let me share the recipe with you. It comes in a class, with sauteed apples and tuile covered in dulce de leche mousse followed by a layer of caramel sauce. If the recipe below seems a little too daunting, it might be best just to pop over to Vaniyé and sample a dessert for yourself. It’s always a good decision. Stop the cooking by adding the butter, then hot cream and water little by little. Stir well until smooth and well combined. Caramelize sugar in the a pan. Stop the cooking with butter. Add the apples and vanilla and cook on low to medium heat until soft and tender and moisture all evaporated. Melt liquid cream and chocolate together in the microwave on low heat. Mix all the ingredients in amixer until well combined – do not over mix. Leave in the firdge for at least 2 hours to rest. Spread thinly onto paper into desired shape. Break the tuile into small pieces on top of the apples. 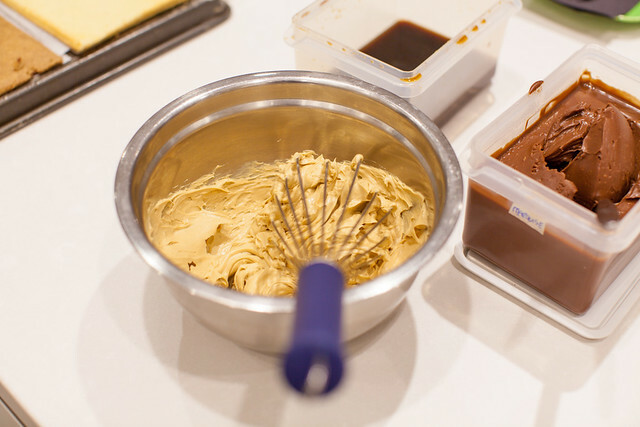 Pour or pipe the Dulce de leche mousse. Spoon a couple of tablespoons of caramel sauce on top. Sonia made puff pastry garnishes coated with sugar for the final touch. They were perfect.